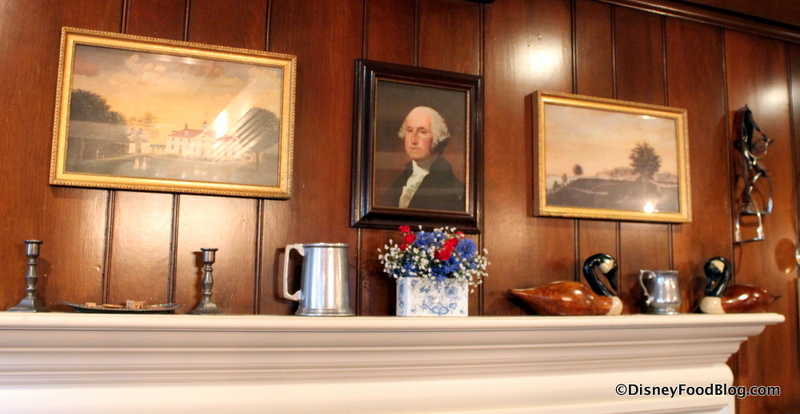 Likewise Thomas Jefferson is celebrated in this stately room with white paneling and yet another fireplace mantle. John Paul Jones has his portrait near a faux-door and a decorative coat rack. 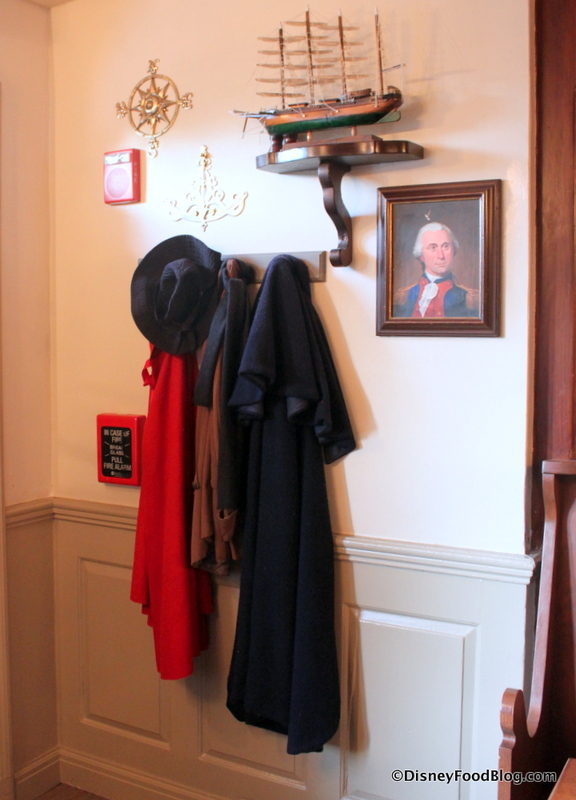 Benjamin Franklin‘s room is all about that dark wood molding. Paul Revere‘s dark moldings have a similar feel, but lots of pewter pieces differentiate his space. Betsy Ross is also commemorated here, with an example of her famous flag. 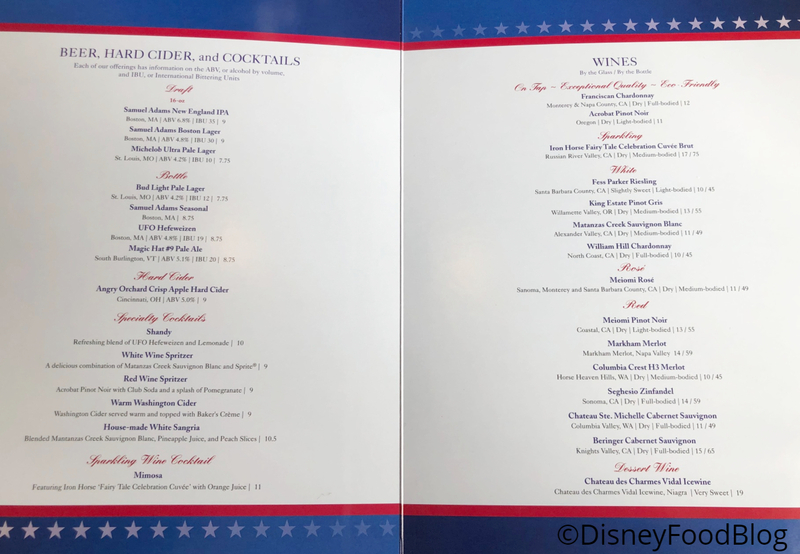 Alcohol has been served at Liberty Tree Tavern since 2016, when Magic Kingdom first expanded it’s adult beverage offerings; and the drink menu is extensive, as befits a tavern, right? Choose from beer, hard cider, cocktails, or wine. 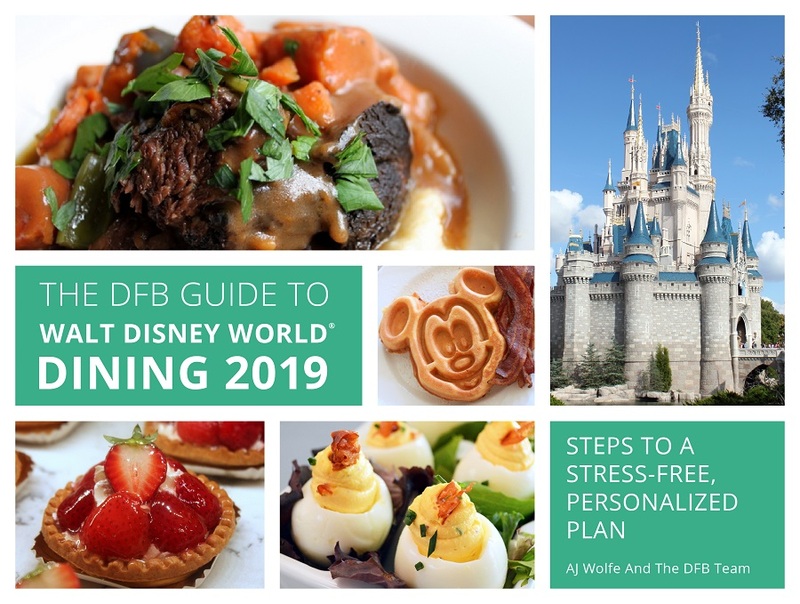 And remember that if you’re using the Disney Dining Plan (and you’re of age) you can select one alcoholic beverage to enjoy with your meal. Lunch consists of two options: A la Carte and Bill of Fare (a/k/a the Patriot’s Platter). A la Carte entrees include Our Tavern Keeper’s Favorite (which happens also to be a guest favorite!) Pot Roast, Tavern Battered Fish and Chips, and The Colony Salad. 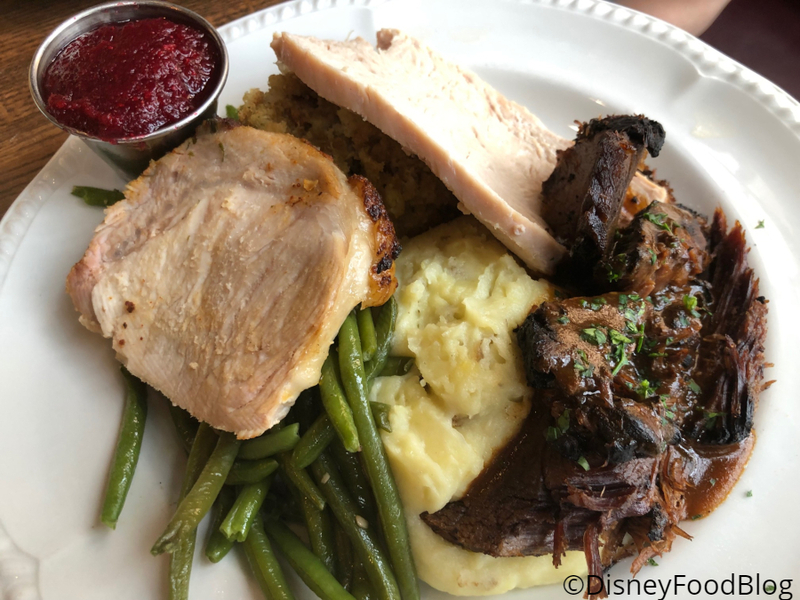 You can also order The Pilgrim’s Feast (essentially Thanksgiving dinner on a plate!). 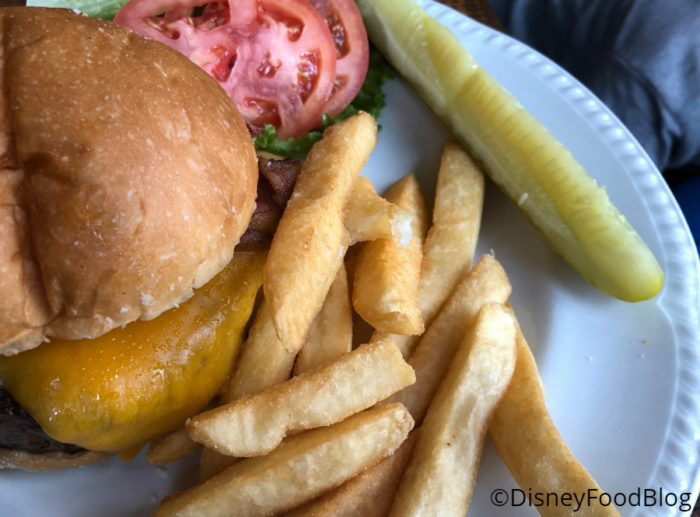 Notice that the BELL Burger we enjoyed last October as a secret menu item is now on the regular menu! Whatever you choose, the meal at Liberty Tree Tavern starts with rolls and butter — simple but good. 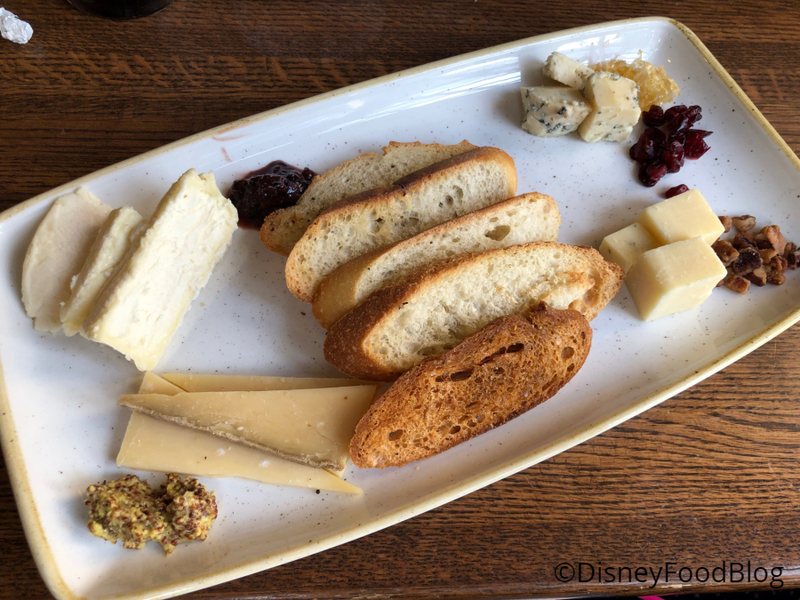 We ordered three appetizers from the A la Carte menu, starting with the Vermont Cheese Plate. It’s pretty much impossible to craft a cheese plate I don’t like, and this one is a particularly good one! The serving size and quality is better than some I’ve had in signature restaurants. The cheeses themselves were typical — brie, cheddar, blue, and what tasted like a gouda. 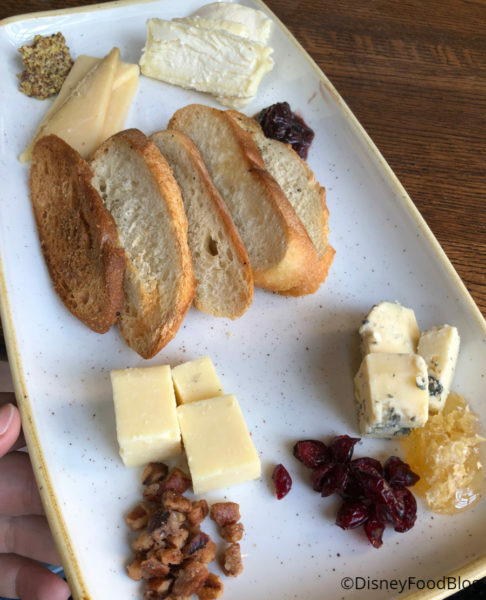 It’s a good plate for someone new to cheese plates, or for a kiddo trying a cheese plate for the first time. What’s better than one cheese-focused appetizer? A second one! 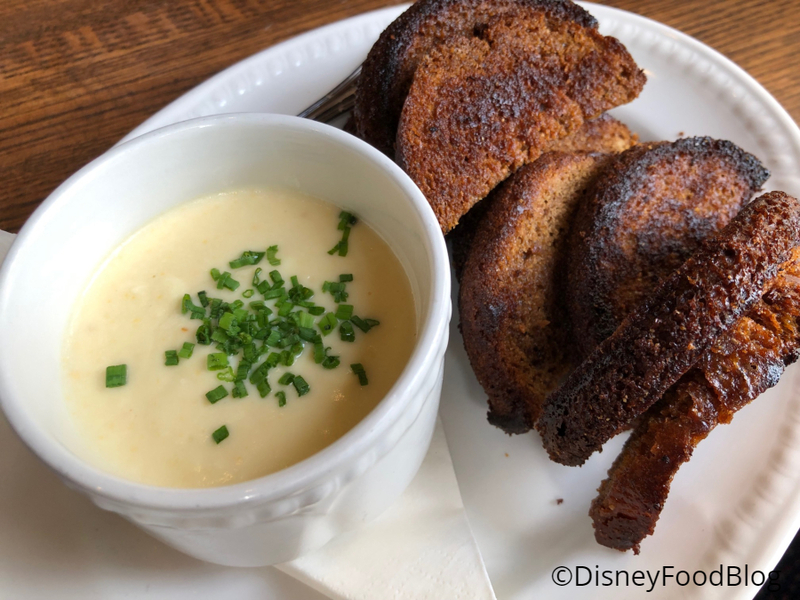 The Tavern Cheese Dip with Brown Bread is dynamite! The bread is quite sweet, which might be a little off-putting for some, but with the salty, savory cheese, it worked for me! I loved this one. 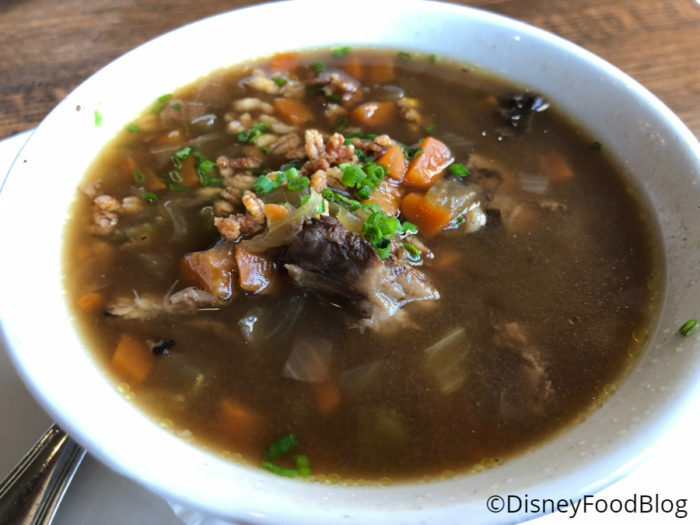 If it’s a chilly day in central Florida — or if you just love a bowl of soup — the Beef and Barley is a decent option. It’s not a wow dish — and the flavor could have been more pronounced. 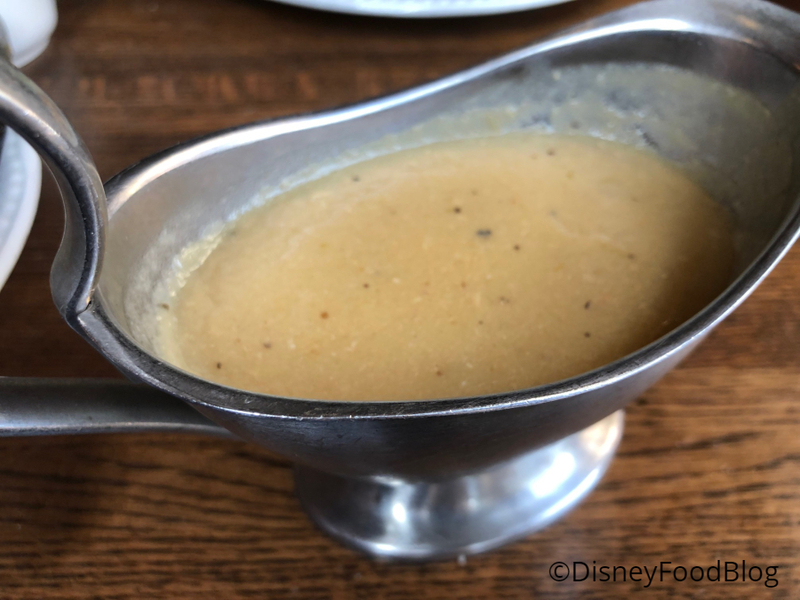 The soup is packed with bits of pot roast, so if you want a beef option but can’t pass up the turkey entree, this is a way to enjoy some of the Tavern’s roast beef. Overall, though, if you’re able to go for one of the other appetizers, this one is OK to miss. First up from A la Carte entrees: Turkey Pot Pie. 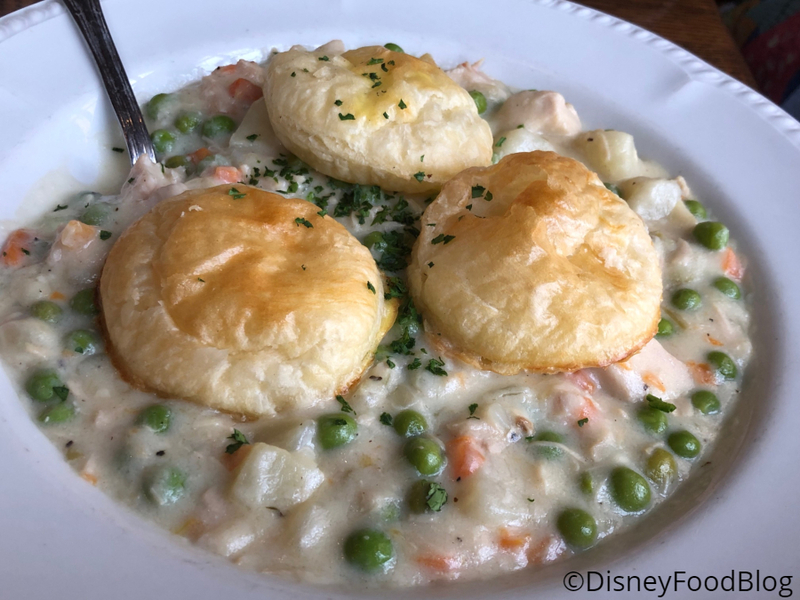 This is essentially comfort food in a bowl, with the pot pie filling topped with rounds of puffed pastry. It hits all the flavor notes you want from pot pie (even though I’d love to have a proper crust!). I also ordered the Bacon Cheddar Cheeseburger which — hello! — looks awesome. This is a a classic burger done very well. All the traditional elements are there: relatively crispy bacon, rich cheese, lettuce, and tomato. 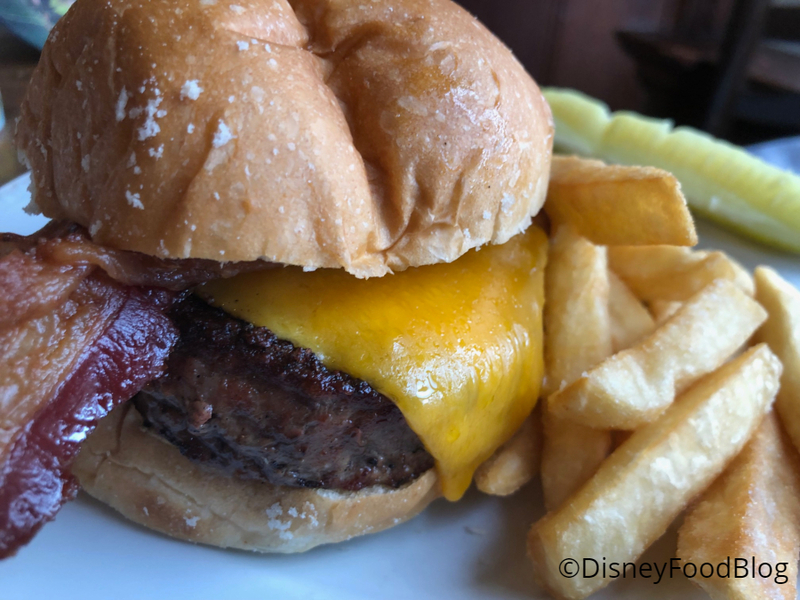 Note that I had to order this one for my 5-year-old since there wasn’t a burger on the kids’ menu (he’s in that “I don’t eat anything except french fries” stage). The burger patty itself is massive and (thankfully) not completely dried out. I wouldn’t say it’s the juiciest burger I’ve eaten, but it was pleasant and tasty. 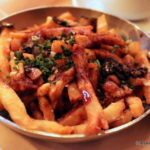 The fries on the side were golden brown and perfectly crispy on the outside, soft on the inside. 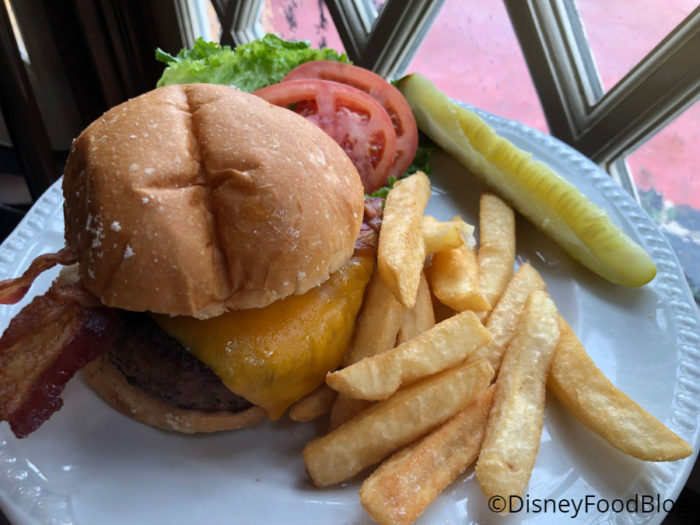 It you’ve got to have a burger when it’s time to dine at Liberty Tree Tavern, this will make you happy. Now for the Patriot’s Platter and everything that comes with it. This offering is the main event at dinner (no A la Carte menu during dinner time! ), but it’s also a popular lunch offering. That’s because with the Patriot’s Platter, you get to sample three meats and enjoy traditional sides. Note that everything is all you care to eat – so you can get seconds and thirds if you’d like. The Platter begins with the Declaration Salad. 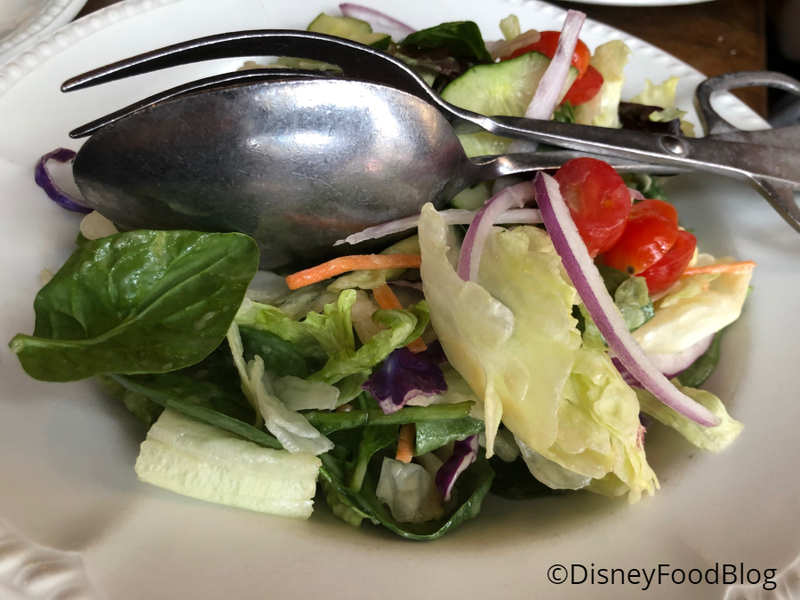 This is a bowl of mixed greens, onions, tomatoes, cucumbers, and carrots. 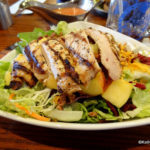 It’s… a salad. Nothing inspiring here at all. But if you are trying to balance out rich meal offerings with light, this is a good way to do it. 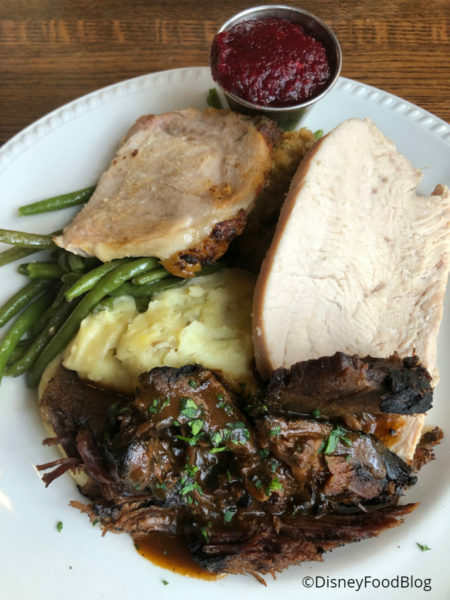 The Patriot’s Platter consists of Roasted Turkey, Oven-Roasted Pork, and Pot Roast. 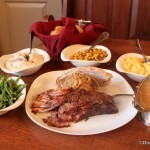 Sides include mashed potatoes, seasonal vegetables (green beans! yum! ), stuffing, and mac and cheese. Note that even though two of us at the table ordered the Patriot’s Platter, we each got our own serving plate for the entree — they didn’t pile two orders’ worth of food on one big platter for us to server ourselves, which is what happened previously. 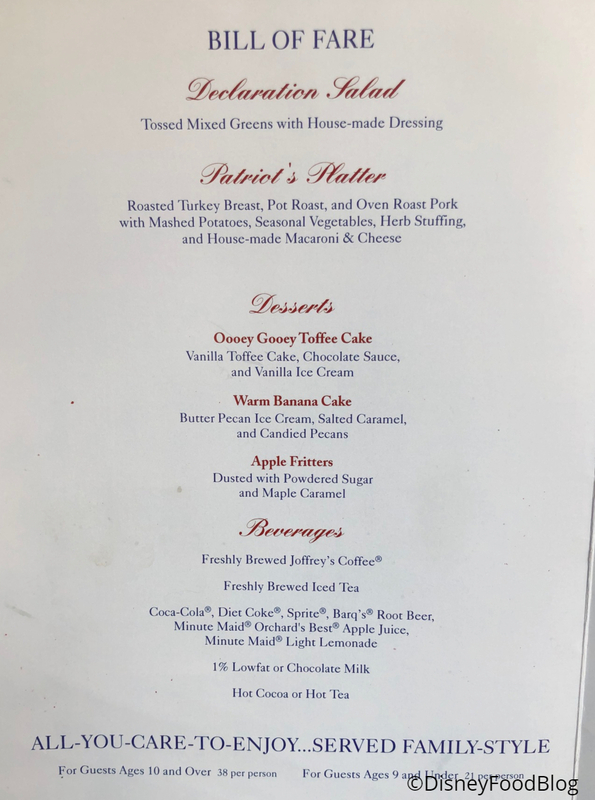 Also note that the Patriot’s Platter serving does include a small container of the cranberry sauce, which previously was by request only. 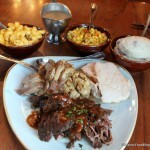 The meats are all passable here, with the pot roast being the most moist and flavorful on my visit. The pork was particularly dry, however. The sides were all delicious. The mac and cheese comes in a separate dish. Sadly, it’s super bland and boring. Nothing like it used to be when Liberty Tree served Stouffer’s Mac and Cheese. If you’ve got kiddos with you, they’ll probably enjoy this, but for the adults in the crowd, I hope your mac is better than mine was. 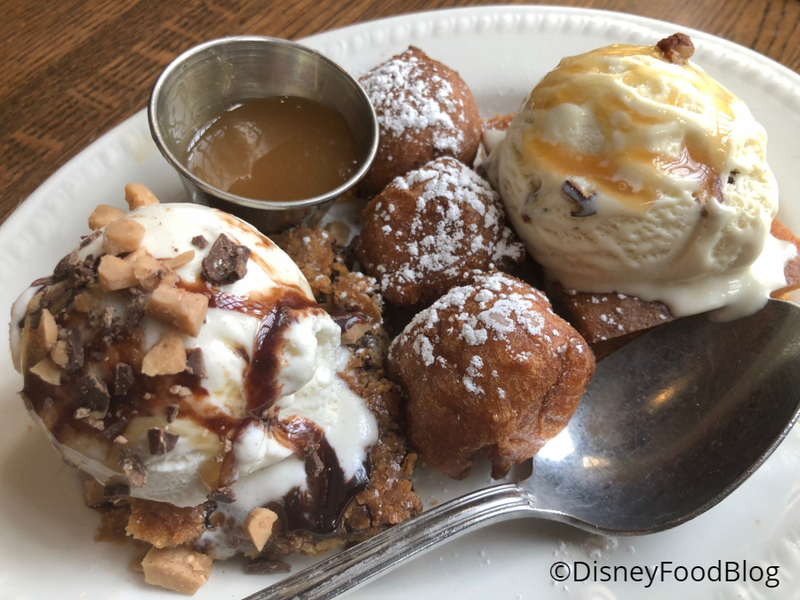 Now we enter the sweet part of our dining experience, and you’re probably anticipating… Ooey Gooey Toffee Cake. And there will be some! But first: a newish dessert for Liberty Tree Tavern: Warm Banana Cake. This dense, layered cake is served with butter pecan ice cream that’s swirled with salted caramel. The the cake is fine — definitely packed with fresh banana flavor (not just a fake additive which… yuck), and the ice cream is delicious. But it didn’t have the dense sweetness that you’d expect from a pound cake or a butter cake. The standard portion shown here is more than enough to share. The Patriot’s Platter comes with a trio of desserts that are served family style (so two portions on one plate, in this case). 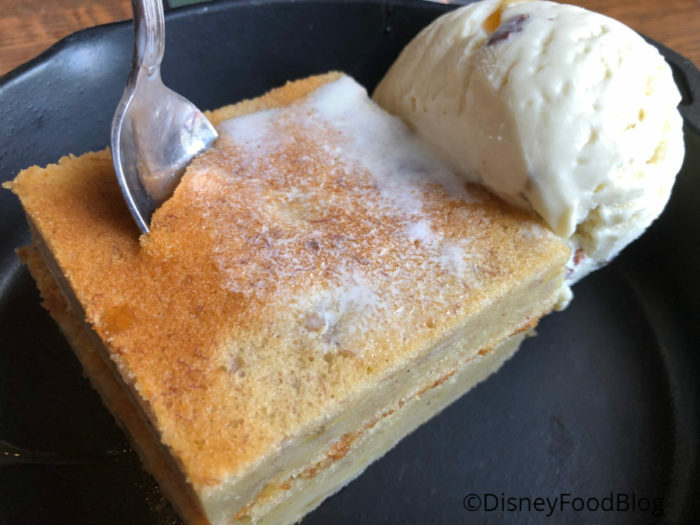 Of course the first of the trio is the restaurant’s iconic Ooey Gooey Toffee Cake which, I’m thrilled to report, is as awesome as ever! If you want to make Ooey Gooey Toffee Cake at home, we’ve got the recipe here! Not gonna lie: the Ooey Gooey Toffee Cake is on the small side. It’s possible to need a second serving of that, even with the other desserts on the plate. 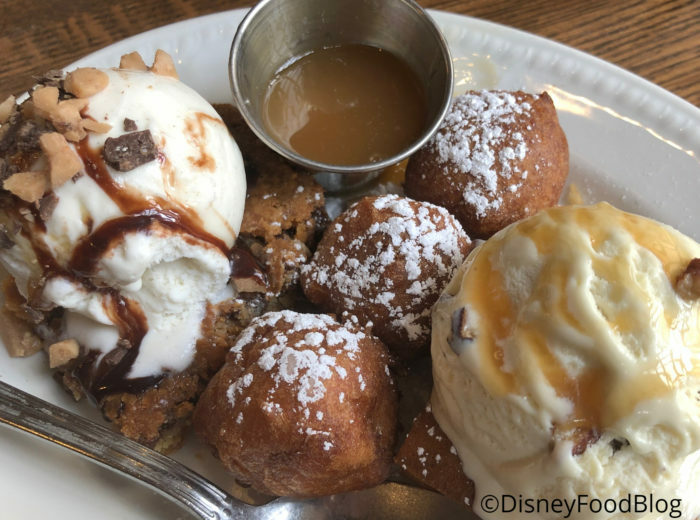 Those include a smaller version of the Warm Banana Cake and also some Apple Fritters with caramel dipping sauce. Ooey Gooey Toffee Cake still rocks! The other dessert is a smaller portion of the Banana Cake. You’re looking for some serious comfort food at Magic Kingdom. 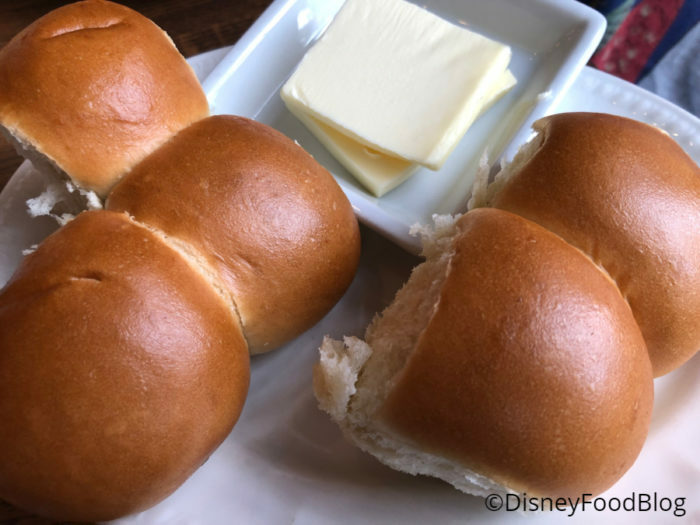 Table service dining is something you want to incorporate into your day at Magic Kingdom. You love history and want to see how Disney interprets it in this space. You’re way too busy for table servicing dining! 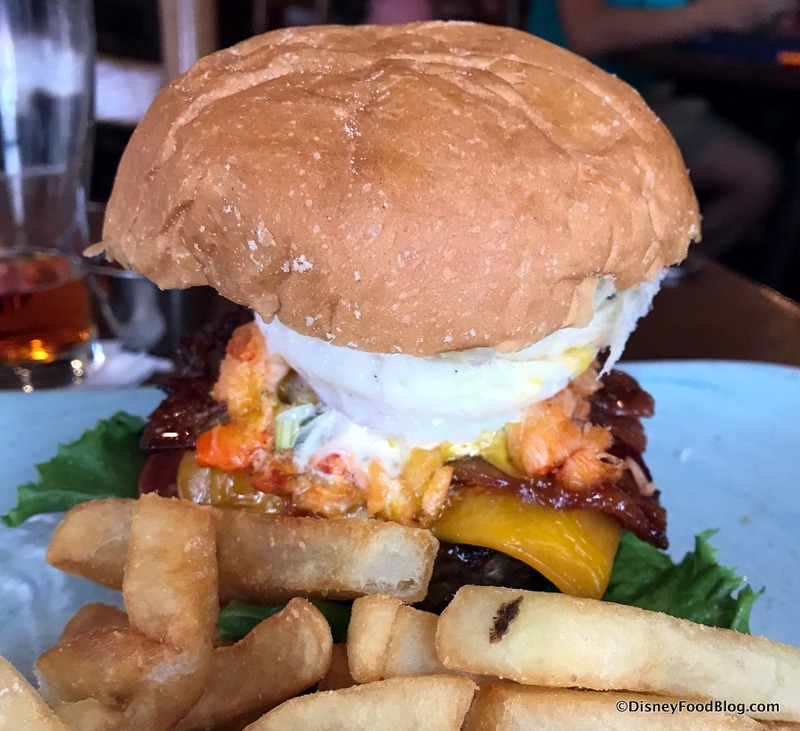 You and your crew want to sample more adventurous dining. 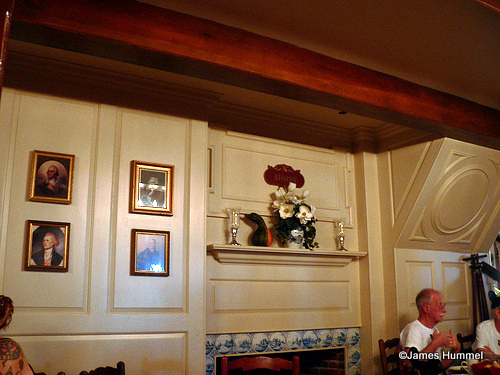 The idea of eating in a colonial-themed spot just feels meh to you. I like to try Disney Parks restaurants over and over again, and one reason is to be sure that I can keep recommending them. 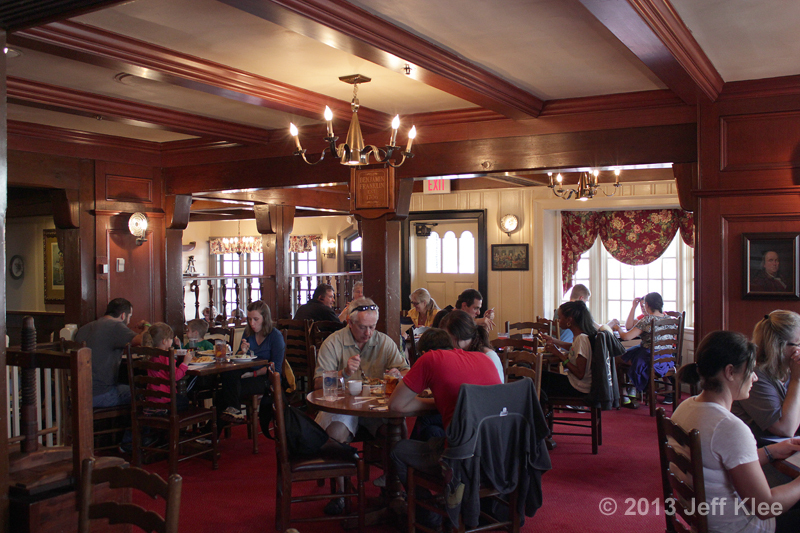 Liberty Tree Tavern is a solid bet every time. The food isn’t overly fancy or trying too hard — and that’s in keeping with the restaurant’s theme. 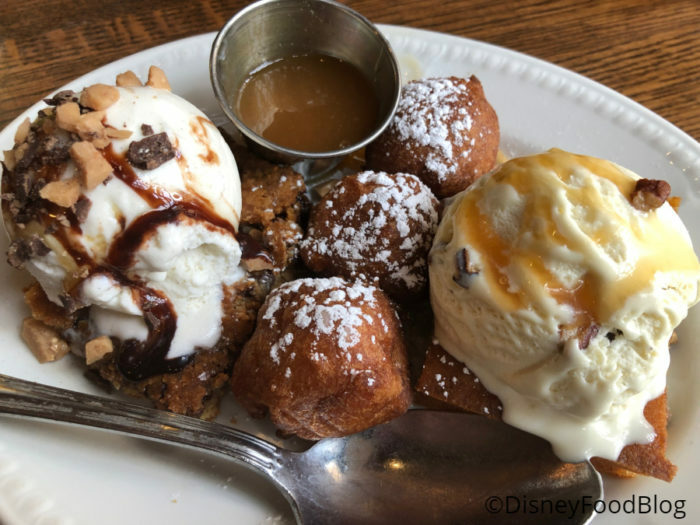 Liberty Tree delivers on comfortable Americana with familiar dishes and flavors, and it’s nice to know that in a World where food trends come and go, Liberty Tree Tavern is a sure thing! What’s your favorite part of dining at Liberty Tree Tavern? Tell us about it in the comments! 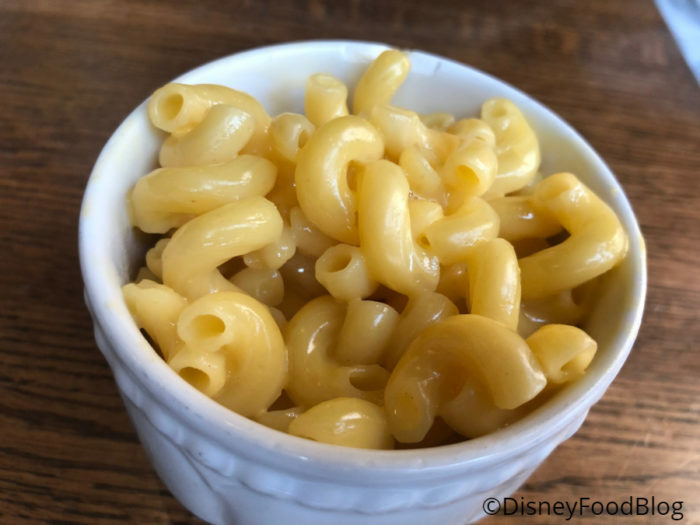 Our mac and cheese was no better last month for dinner. I really couldn’t taste any cheese, just bland pasta. 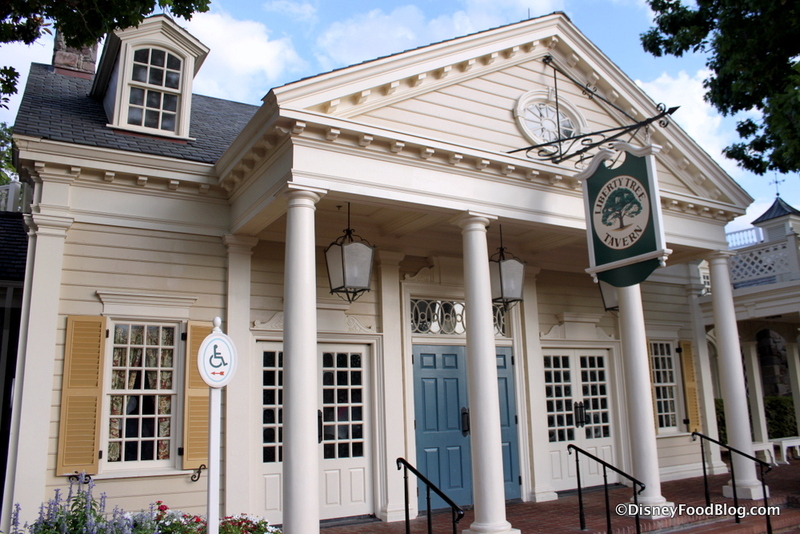 I havent been to Liberty Tavern since 2008. I used to go every vacation. Sadly when I was there in 2015 they were renovating. Once it reopened I was disappointed that this is no longer a character meal for dinner. I enjoyed the food and meeting the characters in colonial attire. In 2017 my travel agent booked LTT for lunch thinking there was no way I could get BOG for dinner. I was able to change it for dinner. Now with the changes to BOG what I ordered is no longer available. Maybe its time to try LTT again. I will be back at WDW this fall. See ya real soon. My favorite place to eat in MK. This place makes me so conflicted. But last time we were there the service we had was appalling. Worst I have had in all of Orlando for years. I actually used the phrase ‘why does she hate us?’. And it wasn’t just that the server was naturally grumpy – she was laughing and joking with the table next to us. (We are ALWAYS polite to anyone bringing us food in particular, so I had no idea what could have triggered her). She literally threw the extra mash (at dinner) we requested from the ‘all you care to eat’ platter at our table. David, so many choices! Have a great trip! I like LTT, though the rest of my family is a little more meh about it. I’m glad to see they still have the a la carte option for lunch. When we passed by there during our visit to Magic Kingdom a couple of weeks ago, it appeared from the menu posted outside that the Bill of Fare was the only choice, even at lunch. 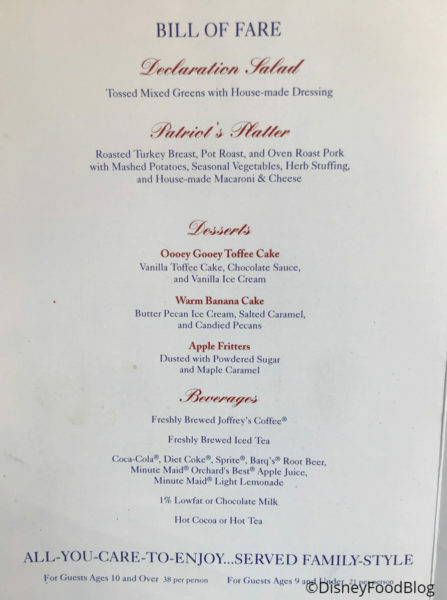 When I started reading your post, I was having trouble understanding why anyone would order anything other than the Ooey Gooey Toffee Cake for dessert. But those fritters look yummy. One other thing I love about this place — they announce what state you’re from when they call you to be seated. It’s kind of neat to see where everyone else has traveled from. I’m glad to know you don’t have to do just the Bill of Fare either. My best friend and I had the same experience as Shayne mentioned above. And since money was tight for me, we ended up not going in. 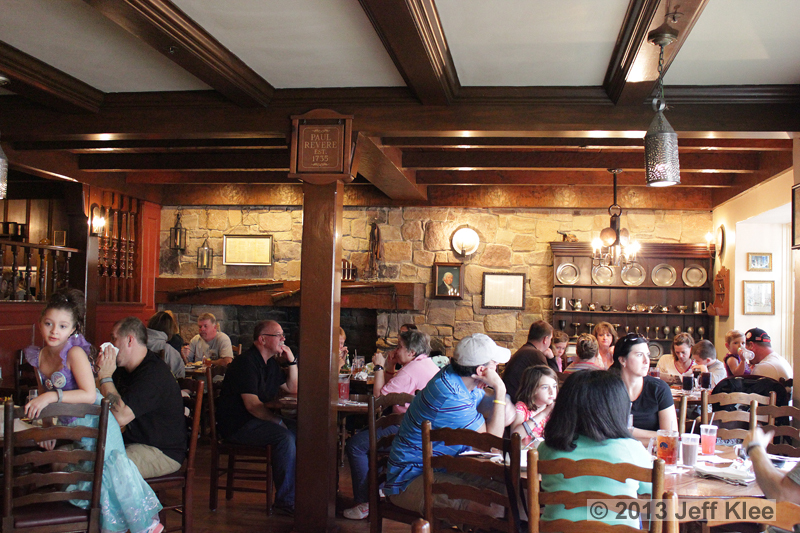 I just had my first experience at the Liberty Tree Tavern just a few weeks ago. Yes, the cheese dip was quite nice, but I have to disagree with you on the Beef Barley Soup. It was my favorite of the whole meal! Now, soup can be different every day if you have alternating chefs and depending on the day of the week, so that may account for the difference. Mine was delicious, and there were huge chunks of roast beef in it (the same delicious roast beef in the platter). Everyone at my table agreed. The pork was indeed dry-dry-dry and the mac & cheese bland. The turkey wasn’t particularly inspiring either. But that soup …. I’ve had dreams about that soup! I’d go back just for that! Question: Do they not have the Patriot’s Platter available at lunch anymore? I’ve been wanting to go to Liberty Tree for years, but my son won’t eat anything on the patriots platter as much as I love all of it. I found out you could get that at lunch and that they also have an a la carte option at lunch, so I planned to go for that on our trip. 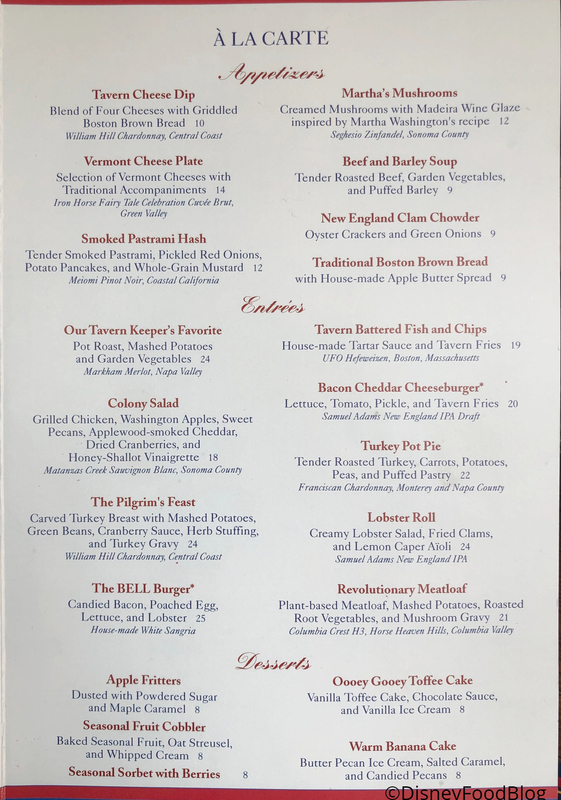 And I had read that they had taken away the Pilgrim’s Feast option at lunch away and replaced it with the Patriot’s Platter. I just checked the menu a couple of months ago and it was still Patriot’s platter. But now I see the Pilgrim’s Feast and not the Patriot’s platter. Is this a seasonal thing? 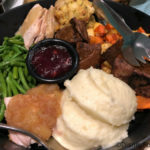 Susan, AJ had the Patriot’s Platter in the review, so it’s currently on the menu — as is the Pilgrim’s Feast. Oh, fantastic! I only saw it listed on the Dinner menu. Thanks for the clarification! If anyone still reads these comments, I have a question; why was the carved beef (flank steak?) taken off the menu? Aurora, sadly we don’t know! We see when menu items are removed, but Disney rarely offers an explanation. I just booked my next magical WDW last Monday. 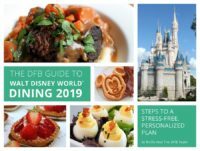 Im going in October and looking for a sit down meal in MK. Am thinking of Fish and Chips at LTT for lunch.